Sound is the spoken language of our soul, created by the vibrations in our throat chakra. Each chakra resonates to a sound or vibration through specific musical notes that are vocalized as mantras (prayers). The seven classical notes of the Heptatonic scale mirror the Bija Mantra. When you vocalize a sound such as a mantra, you can awaken the energy within that chakra. The Sri Yantra, as seen above, is the visual form of the mantra Aum. Aum is the essence of creation and oneness within Hindu & Buddhist philosophy. 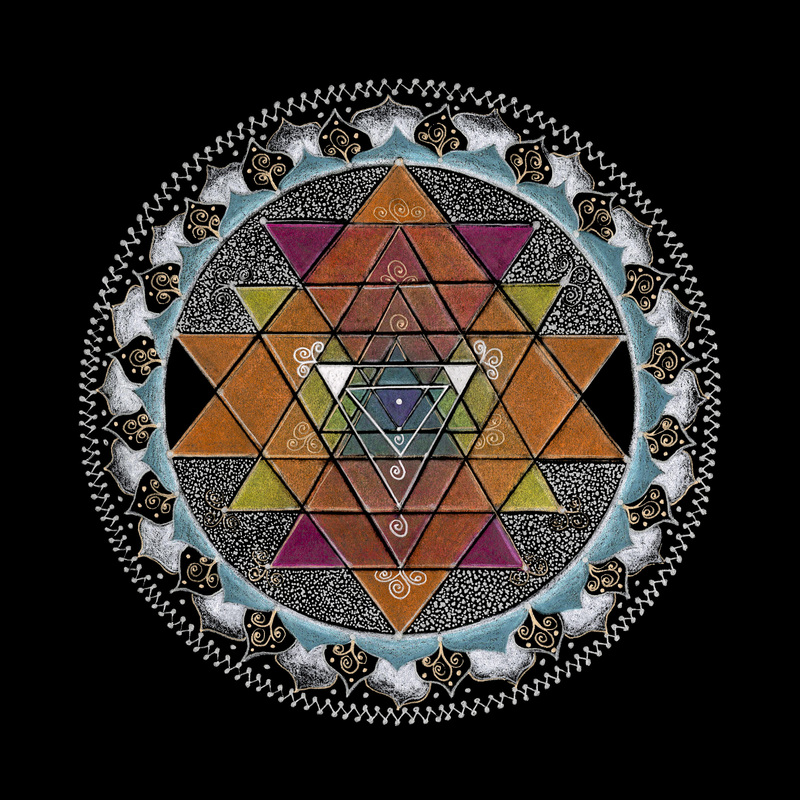 This Sri Yantra represents the merging of Shiva (male) and Shakti (female) energies to achieve spiritual union between the mind, body and soul. This awakens our awareness of the creative life force energy within us. Vibration can be felt without being heard. Our breath creates vibration, our heartbeats create vibration. These vibrations resonate within us, connecting us with the resonance of earth and the universe. The science of Cymatics and Schumann’s Resonance explores these vibrations as eltromagnetic waves or frequencies of invisible energy that affect us and our world. We are most at peace when our heart beats in rhythm with nature because we are interconnected with it. The advent of electronics has filled our “airspace” with invisible frequencies that influence our connections. Message: Take time to listen to the sounds in your life and feel if they align with your soul. Go out in nature, without electronic devices, and connect with the rhythms you share with all that is around you. Sound is vibration and we are vibrational beings. Find your soul’s voice and use it for good.